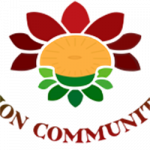 Passion Community UK‘s is the hub where youths with difficult start in life will rediscover their life pathway in career, education and to become socially acceptable in the community. Too often we see our youths’ dabble with drugs, alcohol or face incredible challenges and send to prison. When they are freed, where do they go and who do they turn to? This leads to lack of education, unemployment, more crime, prostitution, substance abuse, homelessness, youth poverty, degeneration and unfortunately even death. These non-conforming attitudes bring in negative impacts on your community, my community, businesses, parents and creating fear in the community. 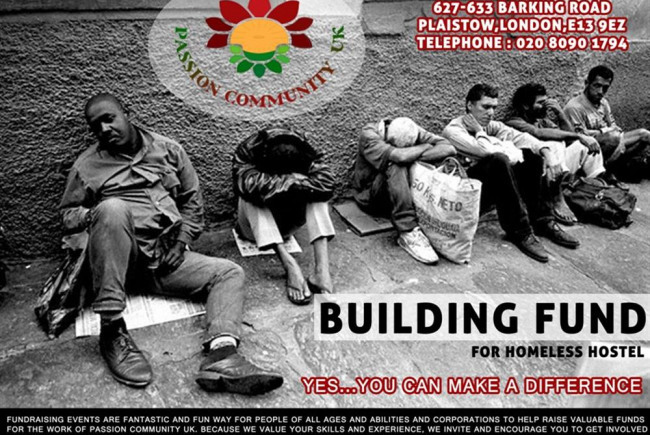 Passion Community UK URGENTLY needs funding to acquire premises. 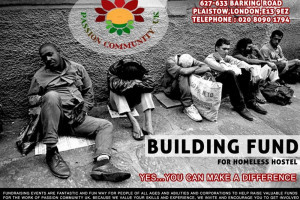 Acquiring a building will enable us to carryout planned activities that will be effective, direct and holistic to alleviate homelessness, poverty, reduce substance abuse, crime and re-sign post those with "I cannot achieve anything attitude to I can achieve anything in life attitude” in the community.We are creating self-empowerment structures for disadvantaged youths to alleviate youth poverty, alienation, homelessness and abuse in community. that will benefit the Local businesses, parents, teachers, schools and residents. The programme is a great idea because it’s devised and collaborated with individual youth ideas in Mind. Believing each youth is unique and can be aspire to succeed if giving the Opportunity. This programme will benefit Youths, businesses, Parents, Teachers and residents in the community by reducing youth homelessness, substance abuse, crime and disorder and increase literacy, employment, self-improvement.And any youth who accomplishes our stage 1 in the programme will be called Associates and goeson to become Ambassadors. 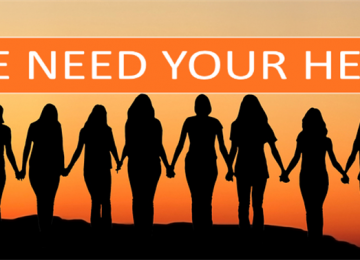 We see young adults giving up their passion in life due to fear, homeless, inequality, despondent, family breakdown and so many unbearable hardships and no one to turn to in their time of crisis. Passion Community UK is for the underprivileged youths from every background. By targeting and helping the underprivileged, the homeless and socially excluded young adults to prepare to re-enter society through training, counseling, advise relevant to their situation, mentoring and setting up goals for themselves and practicalize it. We don’t just provide a service! We support and train our Associates/ambassadors all the way through their progression in career path, life. We provide FREE devised and collaborated tried and tested techniques in providing training. Passion Community UK is dedicated to bringing the lost young men and women back to fulfilled life. 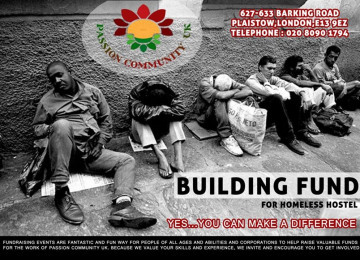 Passion Community UK provides wide range of free service to disadvantaged youths in the community. Aiming to give every 16-25 year olds a chance in Life. 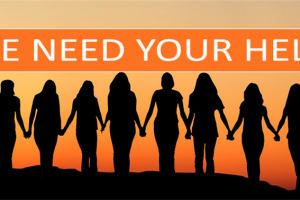 After seeing youths in situations they are unable to return to normality or even killed, the heart of a mother pricked Vivian as a wakeup call and Passion Community UK was set up in 2013. Passion Community UK is the brainchild of Vivian who also had suffered poverty and lack of education when growing up, but as a teenager, she made up her mind to help youths and teenagers who may be in similar situation. Passion community UK is set up and run by Vivian and like minded men and women disturbed by the non-achievement culture of the youths in our community. Our mission is focus on training, helping and supporting 16-25 year old troubled youths in the community. We use holistic approach, with free training of special skills for the emerging job market, the Arts, drama, music, mentoring, counselling, self-development projects, sports, agriculture and outreach. Project Delivery Manager: Vivian Opia The Project Delivery Manager takes legal responsibility for receiving and spending the funds raised and ensuring the project is delivered.